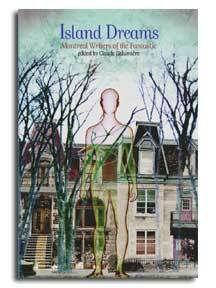 Island Dreams is an all-new anthology of daring and imaginative tales from established authors as well as new voices. Science fiction, fantasy, horror, surrealism, and other outré; genres are on the menu, from the pen of authors such as Yves Meynard, winner of numerous awards for his French-language fiction and author of the English-language novel The Book of Knights; Glenn Grant, co-editor of Northern Stars and Northern Suns; Mark Shainblum, co-creator of Angloman and Northguard; Melissa Yuan-Innes, a Writers of the Future contest winner; Mark Paterson, a leading voice in the Montreal spoken-word scene; Maxianne Berger, author of How We Negotiate; Martin Last, co-founder of New York's legendary Science Fiction Shop; Shane Simmons, creator of Longshot Comics; and Dora Knez, author of Five Forbidden Things. Other contributors include Linda Dydyk, Elise Moser, and Christos Tsirbas. Praise for Witpunk , edited by Claude Lalumière: "Twenty-six big laughs at the way the world turns ... strongly sardonic fiction ... Ringingly brilliant." -Kirkus Review Claude Lalumière founded Nebula in 1989, a Montreal bookshop devoted to "the fantastic, the imaginative, and the weird," which he managed through most of the 1990s. He writes a weekly Fantastic Fiction column for the Montreal Gazette. As an anthologist his books include Telling Stories: New English Fiction from Québec, Open Space: New Canadian Fantastic Fiction, and Witpunk. His fiction has appeared in magazines and anthologies in North America, in the UK, and on the Web. His story "The Ethical Treatment of Meat" was shortlisted for the Origins Awards and has been praised by critics as one of the best stories of 2002. Claude Lalumière is the author of Objects of Worship and The Door to Lost Pages. He's the Fantastic Fiction columnist for the Montreal Gazette and the co-creator of Lost Myths. He is the editor of eight anthologies. He lives in Montreal, Quebec. 240 pp 8" x 5.25"